Do you use use rubrics in #Physed? 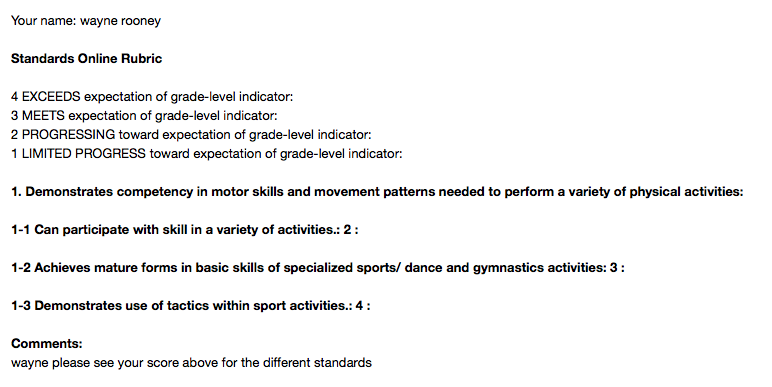 Would you like a supplementary report card for PE? Could you be working a little smarter? Then started to think how I could incorporate that into #PhysEd. Maybe it could be changed into a standards based grade book as such. I set to work to see if it was possible. Below is the ‘how to’ guide to the sheets add on. It seemed to work as the email I got through provided me with a supplementary report card. Now it would be possible to use autocrat to have a more polished version of this, but if you are unsure how to use autocrat, this will do it for you. This could be used in various different ways in lessons from standards based to presentations within sport. The possibilities are endless. Let me know what ways you use it. « Google Apps – Improve your workflow!